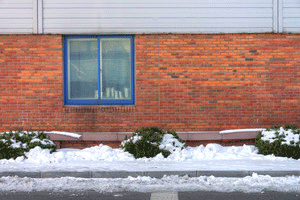 The largest contributors to Toronto masonry damage during winter are moisture, deicers and temperature fluctuations. Luckily, there are a few things you can do to protect your masonry. Throughout the year temperatures fluctuate between hot and cold, wet and dry. During the winter these fluctuations tend to be the most extreme and frequent, putting masonry at the biggest risk for damage. Hands down, moisture is the leading cause of masonry damage all around the world. Moisture is everywhere, it’s in the air, on the ground and during storms it comes pounding down. Masonry is designed to let some water in and then out, but if too much water gets inside it becomes trapped, leading to damage caused by freeze/thaw cycles. When temperatures dip down, the freeze aspect of the equation kicks into play as the water freezes and expands. When the temperature increases, this water melts back to liquid form and decreases in mass. The more frequently temperatures change between hot and cold, the more freeze/thaw cycles your masonry structure is forced to endure. Each time the moisture inside expands and contracts it places pressure on the masonry unit. Every structure is made to withstand only so much of this pressure before it cracks. Masonry structures in Canada will experience as many as 100 freeze/thaw cycles in just one winter. -Check for any signs of mortar joint failure before winter arrives. 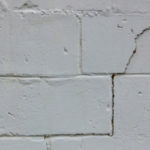 Signs of mortar joint failure include chipping, crumbling, cracking or other issues impacting the mortar running between brickwork. 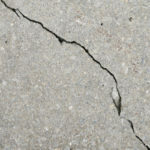 Cracks in mortar joints allow even more moisture to get inside of the unit. Damaged mortar is a sign the structure needs repointing to repair joints to full strength. A professional can restore your mortar so that it is prepared to take on winter. -Install proper drainage systems so that water flows away from your structure. Reducing the amount of moisture that is able to penetrate the surface will reduce the risk for severe freeze and thaw cycles that cause damaging cracks. Salts and deicers are a common tradition come winter. They are poured on sidewalks, streets, driveways and so forth. Sure they’re helpful, but they also contribute to masonry damage. If you use salts on your driveway, or anywhere else near your home, be extra careful that the salts do not make contact with the masonry. This is especially important if you are dealing with a historic building. If the salts are too close to the building they will absorb into the bottom half of the structure and create efflorescence. This is a build up of salts and other minerals that leaves behind an unattractive white stain that could potentially creature further damage. There are alternatives to deicers that still serve the same purpose without the harmful drawbacks in regards to masonry. For instance, try using sand-based products instead. If you plan to clean your masonry structure before the start of winter, proceed with caution. Using harsh cleaners or a power washer could leave your masonry structure more susceptible to damage this winter. The pressure from a power hose can literally blow off the top protective layer naturally built into bricks. If this top layer dissolves, the bricks are left unprotected from moisture and other harmful intruders. 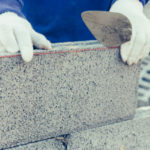 If you are doing repairs or rebuilding an entire masonry structure, it’s important to pick wisely when to have the job done. Weather conditions play a huge role in the final outcome of a masonry project. If repairs or rebuilds are conducted in less than ideal conditions, the results might not turn out as well. Masonry begins to act differently when the temperature shifts below 40 degrees F. The cold impacts new mortar in 2 key ways: first, there is slower hydration of the Portland cement in the mortar and secondly, if the water in mortar freezes this causes destructive expansion. 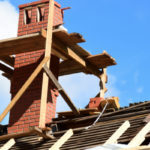 When the weather reaches this temperature during construction or repairs, special precautions are necessary so that masonry properly performs and sets. This includes keeping materials warm with heaters, using enclosures to protect the structure from moisture entry, and properly storing materials. A professional mason should know when to hold off on masonry construction or repairs due to poor weather conditions. While this could delay your project for a week or so, it’s worth it to wait. Otherwise you could end up with masonry that never settles quite right and doesn’t last to its full potential. Contact Turnbull Masonry for leading repairs, rebuilds and new masonry construction. We specialize in both new and historic buildings.